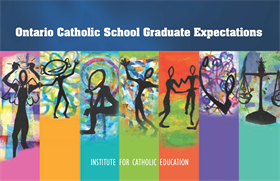 "In 1998, the first edition of the Ontario Catholic School Graduate Expectations was released within the Catholic education community. Immediately they were used as a framework for designing Ontario Catholic curriculum, in the development of youth leadership, teacher education and administrative programs and to support the work of local board initiatives. In 2011, the second edition of the Ontario Catholic School Graduate Expectations has been released. After extensive consultation within the Catholic community the seven overall and fifty-two specific expectations have been validated and remain unchanged. The second edition does however provide a revised preface, a new format, an accompanying DVD, I Believe, and samples of practice in the use of the Ontario Catholic School Graduate Expectations." click on images to get further details or go to Institute for Catholic Education's website, the source of the images and descriptors used.